Our Syrah is deep, dark and brooding with high notes of peach and hints of black licorice. Co-fermented with 4% Viognier, this wine has a delicious floral component. Vivid color and distinctly ripe, youthful Rhone character shines bright with violets, charcuterie, oak and vanilla spices. Sweet blue fruit and silky tannins with a dash of bacon fat create a round, deliciously fresh palate like stream-polished stones. Post fermentation the grapes were pressed into Francois Freres and Seguin Moreau French oak barrels and aged 14 months. Only 157 cases produced. 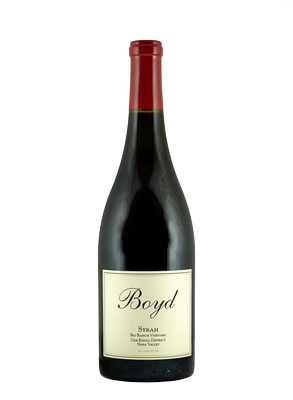 The 2014 Syrah has aromas of sweet blackberry, cigar box, spicy black pepper and subtle hints of violet. A bold offering with bright fruit flavors of dark plum, chocolate and baking spices. Lush tannins lend to the brilliant texture and long, lingering mouth feel in this structured, yet elegant wine.